PARIS -- Chinese giant panda experts and French zookeepers are working to ensure a panda cub's survival after its twin died during the first-ever birth of the rare animal in France. Images released Saturday by the Beauval Zoo south of Paris show mother Huan Huan enveloping the cub and zoo handlers feeding it in an incubator with a small bottle. The pink, hairless male weighing 142 grams (five ounces) is tiny compared to its 190-pound mother. She bore twins Friday, but the firstborn was too weak to survive. "She's a very protective mother, which it makes it difficult" for the panda experts to check on the baby and supplement its feedings, said Delphine Delord, director of communications and educational programs at the zoo. 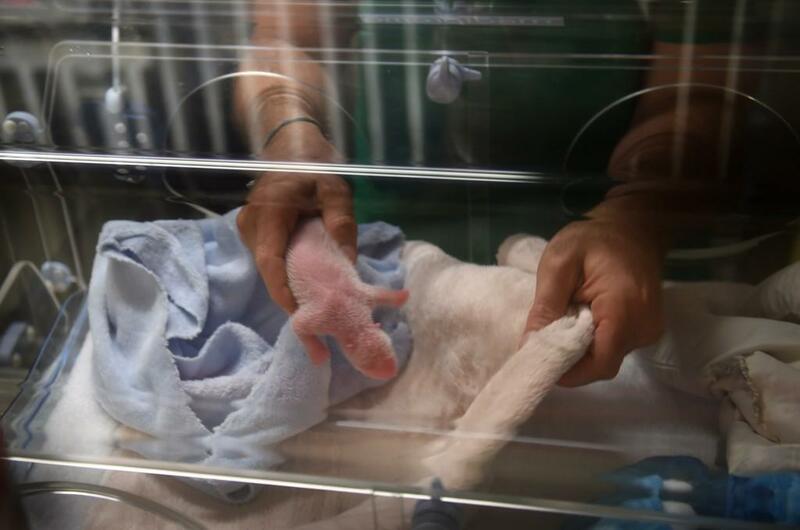 Two Chinese panda experts brought colostrum, or early breast milk, from panda mothers in China to help in the crucial first week, Delord said. Panda births are closely watched because they remain rare - there are only about 1,800 pandas in the wild in China and about 400 in captivity worldwide. Zookeepers frequently need to help raise the cubs to ensure their survival. French first lady Brigitte Macron is the baby's "godmother," Delord said, and she and the Chinese ambassador to France called the zoo Saturday to congratulate it on the birth. "It's a big diplomatic moment as well as a zoological event." Tradition holds that panda cubs born in captivity are named by China. Brigitte Macron is expected to announce the name officially at a visit to the zoo in a month or two, Delord said. The zoo had two bits of good news by late Saturday: the baby urinated for the first time, and its mother successfully began breastfeeding, Delord told The Associated Press. Nine-year-old mother Huan Huan was artificially inseminated from partner Yuan Zi this spring. Both are at Beauval on a 10-year loan from China, and their offspring officially belong to the Chinese government. If the new cub survives, it will be shown to the French public in about two months. Then after about two or three years, it will be sent to a panda reserve in China's Chengdu province once it is autonomous. While the French zoo is upset by the death of the firstborn twin, Delord said it chose to film the birth and share the images with the public. "We made the choice of transparency, to encouraging talking about endangered species, the fragility of their lives," Delord said. Pandas have long been considered one of the world's most endangered animals, although last year a leading group, the International Union for the Conservation of Nature, lowered its classification to "vulnerable" thanks to decades of costly conservation efforts. The Chinese government rejected the group's decision, saying the panda remains at risk. China for decades gifted friendly nations with its unofficial national mascot in what was known as "panda diplomacy" and more recently has loaned pandas to zoos on commercial terms.